The findings, published in Geophysical Research Letters, a journal of the American Geophysical Union, predict that this shift in snowmelt timing each spring could result in a 45 percent reduction of snowmelt period forest carbon by mid-century. A second study, also published in Geophysical Research Letters, found that earlier, slower snowmelt reduces the amount of streamflow, which has consequences for agriculture, municipal water supplies and recreational opportunities in Colorado and other states in the western U.S.
"The recent western drought has been accompanied by a snowpack restricted to higher elevations, with a significant effect on the ski industry," said Tom Torgersen, program director in the National Science Foundation (NSF) Division of Earth Sciences, which funded the research. NSF's Long-Term Ecological Research (LTER) program also supported the studies through the Niwot Ridge, Colorado, LTER site. "Climate variability also leads to conditions favoring earlier and slower snowmelt, with a decreased and prolonged peak streamflow," Torgersen said. "This water flow affects mountain fishing and results in less forest growth. The effects of drought and climate variability on snowmelt reach far beyond farm productivity and urban water restrictions." Forests in seasonally snow-covered areas serve as key CO2 sinks, thanks to the natural processes by which trees take in carbon. This carbon uptake is restrained during winter, but increases to peak capacity in spring when snowmelt provides abundant water to trees. 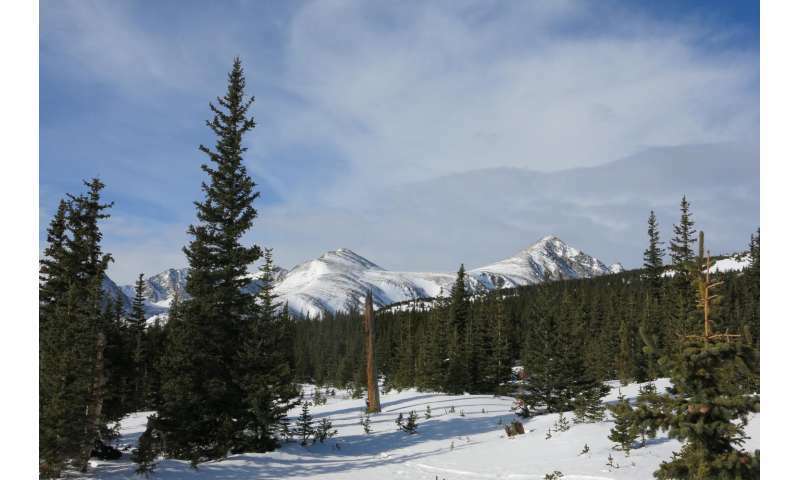 University of Colorado Boulder (CU-Boulder) scientists working at Niwot Ridge in Colorado's Rocky Mountains studied 15 years of snowmelt and atmospheric CO2 data to determine the effects of changes in snowmelt periods. They found that earlier snowmelt triggered by climate change reduces forests' ability to take CO2 out of the atmosphere. "The implications of this research are profound as mountains in the western U.S. are an important part of the regional cycling of carbon and water," said Noah Molotch, the director of CU-Boulder's Center for Water, Earth Science & Technology, and a co-author of both studies. Added Taylor Winchell of CU-Boulder's Institute for Arctic and Alpine Research (INSTAAR) and lead author of one of the studies: "Early melting reduces trees' ability to uptake carbon during the snowmelt period, a key time for seasonal carbon uptake." Snowmelt also provides water resources to downstream communities. Previous research shows that the timing and rate at which snow melts can affect the amount and quality of water available for vegetation, farming and fishing. The researchers used a unique modeling system to study the effects of earlier snowmelt across various regions of the western U.S., including the Cascade Range, the Sierra Nevada, the Wasatch Range and the Rocky Mountains. These areas see significant seasonal snow accumulations that generate water resources for downstream communities. The results show that earlier, slower snowmelt, triggered by warmer temperatures, reduces streamflow. These slower "trickle" melts reduce percolation in hillslope soils and allow more water to evaporate, resulting in less streamflow overall. "Of all the regions we studied, streamflow from Colorado's Rocky Mountains is most sensitive to changes in snowmelt," said Theodore Barnhart of INSTAAR, lead author of the second study. "This analysis suggests that all the regions studied will experience a decrease in streamflow with a decrease in snowmelt rate, with some regions having more streamflow sensitivity than others." CU-Boulder's Molotch added that the findings have broad implications for the scientific community. 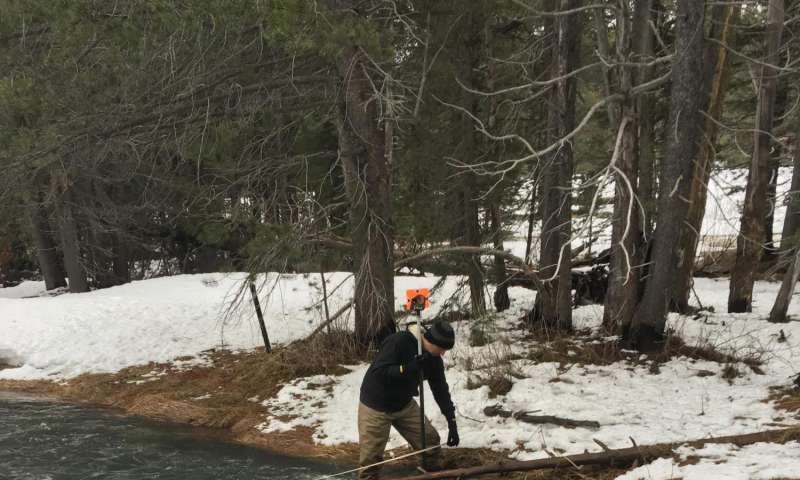 "Given that 60 million people in the western U.S. depend on snowmelt for their water supply, the future decline in snowmelt-derived streamflow may place additional stress on over-allocated water supplies," he said. "These two studies are reshaping the way scientists—and land and water managers—think about climate change in mountain regions."